The source of so many winter travel horror stories is a lack of preparedness. It’s easy to be lulled into driving complacency through the spring, summer and fall, but safe winter driving requires awareness and preparation. Even some worst-case winter driving scenarios can be capably managed if your vehicle is in proper working order, and you have the right mobility and survival supplies on hand. Vehicles equipped with tires that are not engineered for true winter conditions are already behind the eight ball. No amount of driver caution or skill can overcome a hazardous tire traction deficiency. If your winter means regular freezing temperatures and wintry precipitation, winter tires are the single most important vehicle performance advantage you can have. The positive impact of winter tires is difficult to overstate. Winter tire users often consider them transformative to the winter driving experience. Tire pressure fluctuates as temperatures rise and fall. In most parts of North America, the difference between average summer temperatures and average winter temperatures is about 50°F. This means your tires will fluctuate approximately 5 psi (assuming no other air loss) between the coldest and warmest times of the year. A drop of 5 psi during colder months will affect traction, handling, and durability. Make sure your tire pressure is “to spec” before winter begins, and plan to monitor tire pressure intermittently throughout the season as well. It’s critical to have the proper antifreeze/water mixture to avoid coolant freezing and major radiator problems. Also be sure coolant is near full in the reservoir. What’s worse than driving through a winter storm, with road salt and grime caking your windshield and no way to clean it from the driver’s seat? Not much. Be sure your windshield washer fluid is “freeze-proof” before you find yourself in this frustrating situation and with affected visibility. Also, you’ll be going through significantly more washer fluid than usual, so be sure to top off the reservoir, and keep a spare bottle in your vehicle if you can. Consult your vehicle owner’s manual and/or speak to your mechanic, but in particularly cold winter climates a thinner oil may be more optimal for your engine. Freezing temperatures drain car battery power, and if yours is on the weak side before winter begins, freezing temperatures might just finish it off and have you stranded. Your local mechanic or auto parts store can check the voltage of your battery. Also consider acquiring a battery tender, and hooking your vehicle up overnight from time to time just to keep it at full charge. Clear out the old fast food bags and other non-necessities and make some space for mobility and survival driving supplies. Like we said, so many winter driving horror stories are a result of inadequate preparation. Nobody likes having their vehicle loaded to the gills with items that will probably not be used, but in a winter driving emergency you’ll thank your lucky stars for having what you need. Winter driving is fraught with risk that must be counteracted with proper preparation. 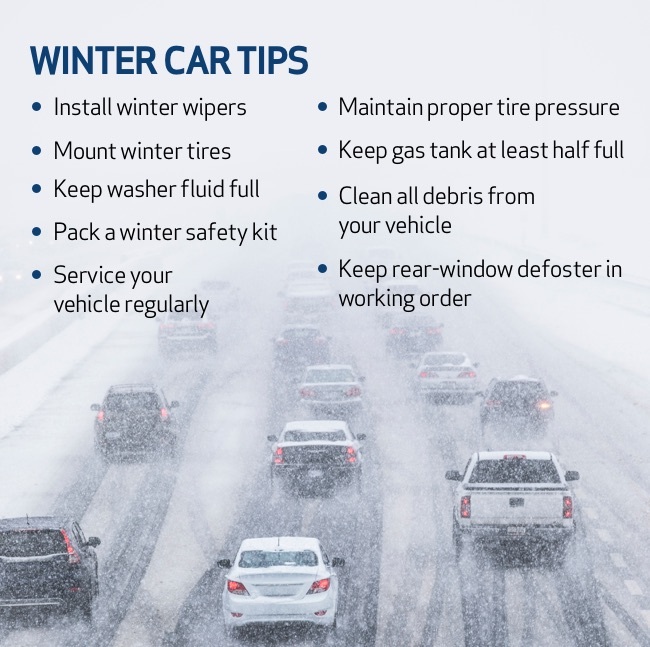 Winterize your vehicle and have appropriate supplies on hand to protect yourself and your family in worst-case winter driving situations.